The scarred rainforest witnessed by the CAO mission. Rainforest exploitation is a concept we have been sadly used to for years. Images of deforestation have long been a common sight in tropical countries, as illegal logging of trees and ever increasing pressure from agriculture keep claiming thousands of square kilometres of virgin forest every year. We’ve even grown accustomed to the idea of one forest being “replaced” with another: from rainforest trees to palm oil trees, millions of them. An industrial forest. But while these issues have long been known of, and are now beginning to be tackled by new policies in several countries, a new and increasing threat to rainforests is quickly emerging in the Amazon: illegal gold mining. 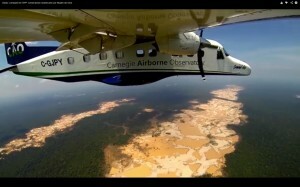 A mission by the Carnegie Airborne Observatory (operated by Stanford University) was able to witness and record on video the ongoing devastation caused by the practice of “informal mining” in the depths of the Peruvian Amazon forest. The exploration team, led by Professor Greg Asner of the Carnegie Institution for Science, didn’t need the highly technological imaging devices at their disposal, to uncover the extent of the damage being caused to this once untouched land. Tens of thousands of poor people are being drawn to the region in the hope to grab a share of the bounty that lies hidden underground, a classic gold rush that is leaving ever larger extensions of the Amazon not just razed to the ground, but also heavily polluted with the chemicals, mainly mercury, used to harvest the gold. No vegetation is able to grow where such small-scale mining operations have taken place, leaving instead barren moonscapes dotted with pools of polluted water where once stood the most complex and rich ecosystem known to mankind. Furthermore, pollutants eventually drain into local rivers, poisoning the fish which constitutes a staple food for humans; recent studies (see CAMEP) have indeed revealed high levels of mercury in indigenous populations, particularly children. By comparison, tree logging and agriculture affecting the region almost look like benevolent practices. 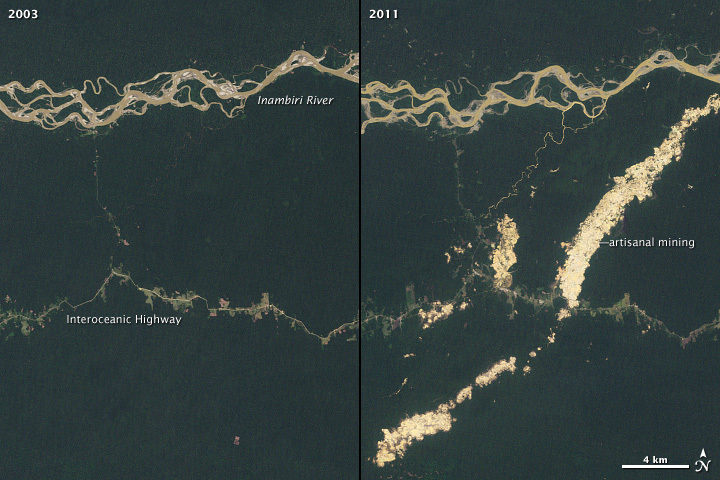 “Deforestation isn’t a strong enough term to describe what’s happening there. It’s truly devastation. It’s as if you put a piece of desert in the middle of the Amazonian rainforest,” says Guido Lombardi, the journalist in the video. According to recent estimates from the Peruvian Ministry of the Environment, something like 30 to 50,000 hectares (3-500 square kilometres) of rainforest have been obliterated in the past three years alone due to illegal mining. And while such figures are still relatively small when compared to the deforestation levels so far caused by more historical activities (an estimated 2,766 square kilometres of forest were razed between August 2012 and July 2013 alone, according to a satellite imagery survey by Brasil’s Space Agency), it is the pace at which illegal mining is increasing year on year that has turned this new practice into the most dangerous threat to the survival of the Amazon rainforest. An estimated 2,100 hectares were being mined annually before the financial crisis hit the world in 2008. Since then, skyrocketing gold prices have more than tripled the annual rate of new mining operations hitting the Amazon, a trend that to date shows no signs of stopping. No legislative measures have yet taken effect to make a real dent in illegal gold mining activities, but missions like that of Carnegie Airborne Observatory, backed by the Peruvian Government, together with other initiatives such as that of the Amazon Aid Foundation (see below the trailer to their pluri-awarded documentary) are now quickly growing awareness of this huge problem by documenting the ongoing devastation through dramatic images, as well as by directly engaging with governments and on the territory to protect the ecosystem, educate local populations and provide economic opportunities that do not require deforestation. Their early involvement and prompt action, in the lack of a firm and coordinated political will, could eventually prove to be the lifeline our rainforests, true lungs of the planet, so badly need. This entry was posted in Environment, Photography and tagged Amazon, documentary, gold, mining, rainforest. Bookmark the permalink.